To ensure your relaxation time is second to none, Made.com has a range of chair shapes and sizes to suit everyone. The eclectic mix of fabric and leather armchairs, swivel love seats and accent chairs come in a wonderful range of colours. But when it comes to a fireside seating it has to be the classic look and feel of a wing back chair. The high back and solid arms work particularly well in traditional settings and for those that just love the vintage appeal. Freshly made to order, the warm dijon yellow fabric and beautiful build is guaranteed to enhance any corner of a room. Special features include scrolled arms, piped edges and striking scooped wings. The firm and supportive sit also allows you to enjoy a comfortable time in front of the TV or reading a book. Upholstered in a natural fabric to blend easily with most interiors. For a touch more grandeur opt for the Murray in antique brown premium leather. Luxury high back leather chairs are undeniably elegant and have an element of the gentleman’s club about them. Built to last with a wooden frame and deep foam filling in a rich brown shade is a winner in any setting. 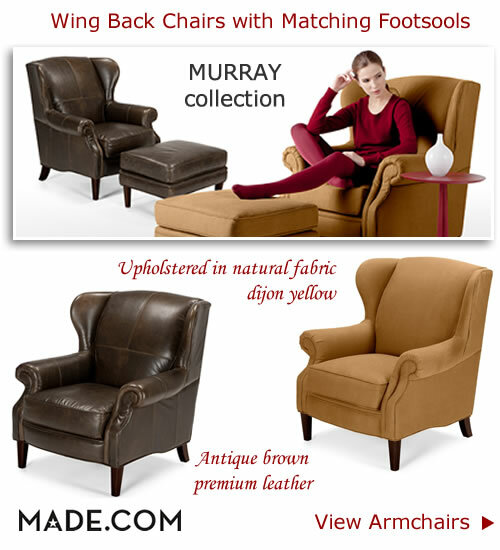 For the ultimate in relaxation the Murray collection includes matching footstools in leather or fabric. Choose from hand worked antique effect leather or go with the organic option with the natural fibre fabric. In addition to a welcomed leg rest the wide flat surface can also be used as a coffee table. A classic of its kind the Murray collection from Made.com offers winning looks as well as easy comfort. Seating height: 49cm. General dimensions: W90 x D94 x H106cm. Seat width- 53cm. Seat depth: 57cm. The frame is made from solid pine and plywood with dark stain wooden legs.